With one click you can apply my noise reduction, sharpening, colour tints and essential tweaks for creating clear and vibrant milky way images. Save yourself hours of repetitive tweaking in Lightroom by using my 50 one click presets for Milky way and nightscape images. Boost your creativity by using these labor saving presets for Adobe Lightroom. By using these 50 presets as a starting point you can then make your own tweaks to further enhance and polish your night photography images. Fix a blown out foreground with one click using my ‘Blown Out Foreground Fixer’ preset. Forgot to switch off the red light when shooting? Overdid it when light painting the foreground? There’s a good chance those image could be fixed with just one click. Many of these presets include tools to repair some of the common problems associated with night photography. Before you hit that trash can icon be sure to give my presets a try. Use my ‘Red Light Obliterator’ preset for Lightroom to fix images you thought were destined for the bin. This product can be downloaded immediately after ordering. Once your order is complete you will receive an email with a download link to a ZIP file which contains the Presets. You can also download the ZIP file from your account page if you set up an account when ordering – which I highly recommend. Use the ‘Foreground Silhouette Neutral’ preset for simple but effective enhancement. Need a more natural tone in your grassy foreground? Use my ‘Grassy Foreground – Blue Light Fixer’ with just one click of the mouse. From there you can make further tweaks and enhancements for a truly unique image. Get a more natural tone with my ‘Grassy Foreground – Blue Light Fixer’ preset. Sometimes you don’t know what changes you’d like to make until you get inspired. Presets like my ‘Warm Glow – Cold Heart’ give you those instant ideas with just one click. Where you take it next is up to you. Use my ‘Warm Glow – Cold Heart’ preset for instant enhancements to ‘Tungsten’ images. In addition to the repairs and enhancement presets, I’ve also included plenty of tasteful ‘natural’ looking presets for those who like to keep it real. Go for the natural look with the ‘Lighthouse Natural’ preset. 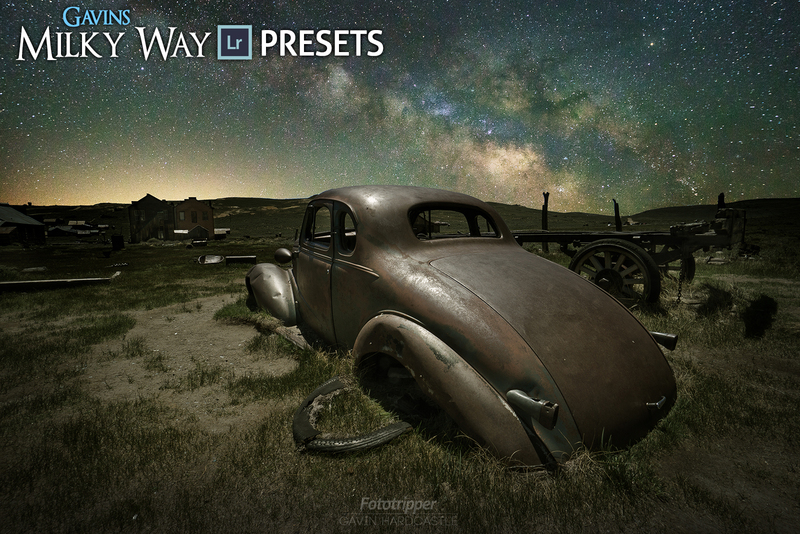 ‘Gavins Milky Way Lightroom Presets’ is a collection of custom presets for Adobe Lightroom created by Gavin Hardcastle. These presets are delivered as a ZIP file which can be downloaded and unzipped. You can then import the presets into your installation of Lightroom. Instructions are included with your download.